Pro: in favor of; favoring, supporting; acting as a substitute or deputy for; denoting motion forward, out, or away; before in time, place, order . In due course, one of the primary consequences of global warming will be the alteration of the existing landscapes; natural and artificial. Multiple global effects will overwhelm the composition of the biosphere as a whole and increase the temperature of the environment, subsequently altering the world as we know it. As has occurred several times in Earth’s history, the biosphere will undergo a recalibration in an attempt to combat the entropic nature of this global alteration. Natural systems behave both individually as well as in a synchronocistic manner. While it is logical that as Earth’s ice will melt, the volume of liquid water will increase and the hydrological cycle will shift its trajectory. This transformation will cause many more seemingly unrelated phenomena to occur. Since the composition of the biosphere is multi-scalar and multivalent, its order is not closed and isolated. On the contrary, it is in an open environment and is thus a system in a state of disequilibrium where a gradual slipping toward chaos is constantly fought, a char- acteristic ultimately made more difficult because of human occupation. The resulting natural phenomena will have drastic and immediate effects on coastal cities as they endure the inundation of rising seawater levels. This inevitable consequence will jeopardize existing infrastructural systems that critically depend on main- taining the edge between land and sea. Seawater will intrude, causing dramatic shifts in the natural and artificial systems that depend on a delicate balance and constant control. Steady state compositional actions will undeniably fluctuate to varying degrees and extremes. In order to protect our own interests, these changes will require intervention. The purpose of instituting Pro|Terra|Tecting is to anticipate and encourage the shifting stability through a holistic manipulation of the relationship between land and water. The creation/addition of new spaces will en- courage homeostasis within and around the city, cultivating a protean network required to achieve a balance between the constituent systems. 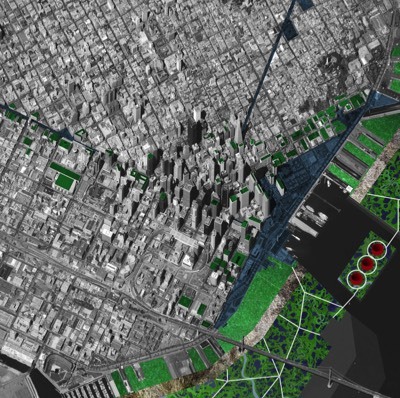 This new metabolic relationship between land and water will allow for constant interaction and feedback, while the compartmentalization of the city will be retrofitted to account for macro scale changes. New opportunities for growth and development will emerge as interdependent activities of human economy and global ecology. To anticipate the rising seawater, the concern is to protect, promote and sustain the delicate balance between land and water. Inspired from Christo and Jeanne-Claude’s famed Surrounding Islands installation in Miami’s Biscayne Bay, Pro|Terra|Tecting will imple- ment a biophilic membrane, similar to this installation, surrounding the San Francisco Bay area. This natural membrane will act as a metabolic estuarine network, fostering growth in order to reestablish the linkages between land and water as a fluid system. The strict formalized urban edge will be erased giving way to a metabolic zone of confluence where interactions between land and water are intertwined, thus blurring the hard-lined city edge. This blurring effect allows for actions and reactions to reach homeostasis over time, replenishing the estuary as an ecological haven. The design strategy behind Pro|Terra|Tecting focuses on the duality between land and water. Rather than treat their relationship as purely commoditized entities where the fundamentals of economy dictate the connection and segregation between them, a reciprocal relationship between land and water will offer new opportunity for economy and ecology to exist simultaneously. The metabolic estuarine network enmeshes the surrounding context, shaping and shifting itself relative to macro and micro stimulants. What results is a network of reinte- grated habitats composed of numerous clustered nodes which are connected to sustain and manage the interactions of land and water in a balanced effort. As a result, the metabolized network acts as an open, dynamic system of parts that continually exchanges matter-energy throughout the natural environment within the San Francisco Bay. The integration of Pro|Terra|Tecting into the city will have an equally important effect on the environment as through a meshwork of biophilic reclamation strategies will be employed to process waste, reclaim water and reduce the heat island effect implicit in modern cities. These strategies will integrate themselves into the cityscape and become a method by which human occupation can be beneficial to the San Francisco Bay.